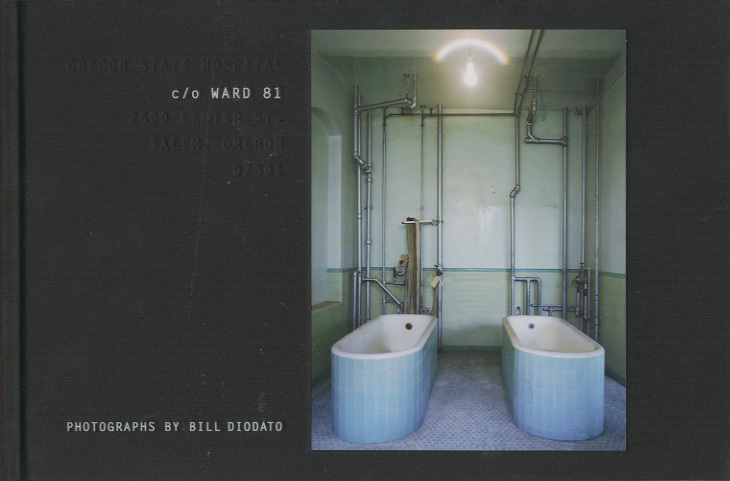 Photographs and text by Bill Diodato. Foreword by Mary Ellen Mark. Golden Section Publishers, New York City, USA, 2010. 64 pp., 46 color and black & white illustrations., 10x6½". Signed and Slipcased version signed by Bill Diodato. The Deluxe Edition is signed by Diodato and Mary Ellen Mark and comes with signed and numbered print. This is Bill Diodato's first monograph. Care of Ward 81 is the first of two books on the subject. Located at the Oregon State Mental Hospital (the hospital where One Flew Over the Cuckoo's Nest was filmed), Ward 81 was set up as a special ward to help women in need by providing them with medical attention and isolation from the world. The ward has been closed due to the lack of funding and has fallen victim to decay. Diodato has stated that this book is about the 'demise of institutional services' and it's effect on women. These are not just images of interior rooms / cells but are spiritually familiar and hauntingly beautiful with a noir sensibility. All the images are reproduced on black printed pages, with each image spot varnished. Wrapped with a transparent acetate dust jacket, the book has a linen-bound cover with a tipped-in photo. The book was designed by Diodato and Warren Mason of Measure Design and contains a foreword by Mary Ellen Mark. Care of Ward 81 is available in a signed, numbered and slipcased limited edition of 100 with both the book and the slipcase bound in Japanese Saifu cloth. The deluxe limited edition of 50 comes with a print, and is also signed, numbered, and slipcased with both the book and slipcase bound in Japanese Saifu cloth. The deluxe edition print of 50 included with the Deluxe Edition is printed on the archival environmentally sound Hahnemuhle Fine Art Baryta paper. This image is printed with the finest archival inks available on the market today. Each print is signed and numbered by the artist. I initially started this project with the idea that capitalist greed was the driving force for the breakdown and decay of this once vital facility known as Ward 81. Somehow the demise of institutional services and how it has affected society was a direct result of capitalism. .... I was alarmed to learn that women who need help for mental illness cannot get it. Many institutions that were once set up to help those afflicted with mental illness are not there due to the lack of funding, causing the demise of institutional services that we are now seeing both metaphorically and physically. Read Rena Silverman's review of Care of Ward 81 in photo-eye Magazine.